Citation: Kleiner JG, Iguban EB. A case report on a rare posterior type of persistent fetal vasculature. Ophthalmol Case Rep. 2017;1(2):25-27. Persistent fetal vasculature, persistent hyperplastic primary vitreous, posterior type, fibro-vascular stalk congenital ocular disorders, congenital retinal disorders. This is a case of a 7-year old, male from Pasig City, Philippines, who came in with a chief complaint of poor vision in the right eye. Six months prior to consult, the patient’s mother noticed that her child would often needed to sit in front of class to see the board. The patient did not state having any other associated signs and symptoms. The patient was born full term to a 30-year old G2P2 (1101) mother via normal spontaneous delivery. There were no fetomaternal complications after birth nor was he confined to the hospital. For this case, the past ocular history and family history were also unremarkable. On physical examination, the patient had a visual acuity of no light perception on the right eye and 6/10 corrected to 6/6 on the left eye. On refraction of the left eye, it had a grade of (-2.50 sph -1.00 cylx180) which gave a best corrected visual acuity of 6/6. Intraocular pressure was 12 mm Hg for both eyes. Extraocular muscle movements were full and equal in both eyes. Grossly, both eyes look symmetric. Hertel’s exophthalmometry was also done on the patient, which showed measurements of 95 mm from both lateral orbital rims, then 14mm from lateral orbital rim to the apex of the cornea for both eyes. Both corneas measured 11 mm each. The right eye had a 3 mm pupil with a grade 4 relative afferent pupillary defect. The left eye had a 2-3 mm pupil, which was briskly reactive to light. Slit lamp findings where unremarkable. Both eyes had deep chambers, clear cornea, anterior chamber reaction and clear lenses. A dilated fundus examination was done. On the right eye, seen through clear media, was a vascular stalk attached to the optic nerve, which extended anteriorly (Figure 1). There were neither hemorrhages nor exudates. The retina also appeared attached. The macular area was not affected. On the left eye, the dilated retinal examination findings were unremarkable. On ocular ultrasound of the right eye, there was note of a hyperechoic line emanating from the optic nerve, which extends anteriorly towards the posterior lens capsule. This hyperechoic line had minimal after movement and low to moderate spikes. Retina was noted to be attached and choroid was not thickened (Figures 2 and 3) .Based on the above findings, a diagnosis of persistent fetal vasculature, posterior type, was made. Since the affected eye had no visual potential, a conservative mode of management was instituted. No surgical intervention for this case was contemplated. Figure 1: Fundus photo, right eye. Figure 2: Axial horizontal ocular sonogram. 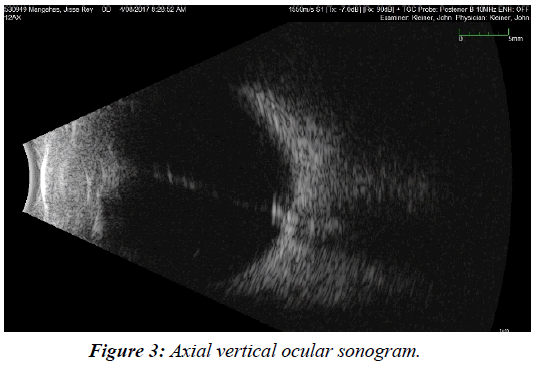 Figure 3: Axial vertical ocular sonogram. Persistent fetal vasculature (PFV) is a disorder arising from a failure in ocular development. This is due to incomplete regression of the fetal hyaloid vasculature [1,2]. It is a sporadic disease which is non-inheritable and has no gestational associations. A total of 312 cases were reported in literature with 90% recorded as unilateral . In a retrospective survey of patients who visited the Jichi Medical University hospital, a total of 7,856 patients, including 4,421 men and 3,435 women was done and they found that the overall prevalence of PHPV was 0.064% . It is associated with microphthalmos, microcornea and leukocoria. Persistence of any of the fetal vasculature elements can be an isolated phenomenon, or can be found in combination. The pathology can be divided into anterior, posterior or combined subtypes. Posterior PFV is often associated with reduced corneal size, and more than two thirds of cases are microphthalmic . Descriptions of normal axial length and normal corneal diameter in PFV patients are rare . Microphthalmia was not seen in our patient. His corneal diameters were also normal at 11 mm. The anterior variant of PFV can present with strabismus, nystagmus, microphthalmos, as well as a white retro-lental vascularized fibrous membrane or mass . The anterior type can also have abnormally long ciliary processes extending toward or into the fibro-vascular membrane or mass. There could also be large radial blood vessels on the iris. At birth the lens can be clear, but can become cataractous. With age, the anterior chamber may also become shallow and cause secondary glaucoma. In the later stages of disease, there can be hemorrhages and fibrosis, which can cause retinal detachments [1-7]. Anterior structures are not directly involved in posterior persistent fetal vasculature. Although there can be occasional microcornea, ciliary processes are, more often than not, normal and the lens is usually clear. A white hyaloid remnant maybe seen behind the lens, White intravitreal membranes can attach to the optic nerve and obscure the cup and distort its margins. These membranes are associated with retinal folds in 2/3 of cases. The macula is always directly or indirectly involved, with associated tortuosity of the peri-papillary vessels . Some systemic syndromes are associated with persistent fetal vasculature. These include Norrie’s disease, trisomy 13 (Patau syndrome), and Walker-Warburg syndrome . Our patient did not have any of these syndromes. He had no feto-maternal complications during delivery, nor had he experienced any developmental delay. Surgical intervention may be entertained when a patient’s visual acuity is 20/150 or less and there is no macular involvement[8-10]. Other indications for surgery are angle-closure glaucoma, persistent intraocular hemorrhage, and progressive retinal detachment. The latter often occurs as fibro-vascular tissue contracts and drags the peripheral retina . Those cases, on the other hand, presenting with no light perception and micropthalmia are not good candidates for surgical intervention [9,10]. Surgical approach usually includes phaco-aspiration with or without intraocular lens implantation (IOL) via a limbal incision. Posterior capsulorrhexis, anterior vitrectomy and fibro-vascular stalk management can also be performed via pars plana with a 25 gauge vitrectomy system . Endo-diathermy is used if there is bleeding or when the echo-doppler examination shows a vascular blood flow inside the fibro-vascular stalk. In a case series of persistent fetal vasculature patients in Brazil from 2001-2012, postoperative complications include posterior synechiae, retinal detachment, phthisis, posterior capsular opacification, inflammatory pupillary membrane, glaucoma, intraocular lens displacement, and vitreous hemorrhage . The visual prognosis after surgical intervention is dependent on the presentation of PFV and its associated ocular characteristics. Visual prognosis is poorer in eyes with posterior PFV than in eyes with anterior PFV. Eyes without posterior disease often trend toward a vision of counting fingers or better . Anatomical and functional postoperative outcomes vary and depend on the fibrovascular stalk width, presence of blood flow inside the stalk, associated microphthalmia, age of lens opacity occurrence, age at surgery and presence of major or minor macular involvement . Without treatment, severely affected eyes can go into phthisis bulbi , However, despite the trend for poor visual outcome, it is still possible to obtain useful vision . In a study by Tartarella et al002C where they performed surgery on 38 eyes, visual acuity improved in 83% of the eyes after surgery, but as much as 50% presented with postoperative complications (retinal detachment and phthisis bulbi . Persistent fetal vasculature is a rare and sporadic disease, which usually presents with microphthalmos, microcornea and leukocoria. Posterior PFV is one of the rare types of persistent fetal vasculature. This type of PFV usually presents with other ocular features such as microphthalmia and microcornea, which is not seen in our patient. Visual prognosis is generally poorer in patients with the posterior type of PFV. Hopefully, with more case reports and better documentation of such cases, we can learn more from this disease entity and eventually formulate a more successful management strategy. Ryan S. Retina (Second Edition). Mosby - Year Book.2505-10. Goldberg MF. Persistent fetal vasculature (PFV) an integrated interpretation of signs and symptoms associated with Persistent Hyperplastic Primary Vitreous (PHPV). LIV Edward Jackson Memorial Lecture. Am J Ophthalmol.1997;124:587-626. Makino S. Prevalence of Persistent Hyperplastic Primary Vitreous.Sch. J. App. Med. Sci. 2015;3:906-7. Haddad R, Font RL, Reeser F. Persistent hyperplastic primary vitreous. A clinicopathologic study of 62 cases and review of the literature. SurvOphthalmol. 23:123-34. DarusmanKR, Aquino MCD, Thamboo TP, et al .A case of persistent fetal vasculature with atypical presentation. Eye (Lond). 2011;25:1521-2. Nicholas C, Farber MD, Eric M,et al. How to treat persistent fetal vasculature. Review of Ophthalmology. 2015. Hunt A,Rowe N, Lam A, et al. Outcomes in persistent hyperplastic primary vitreous. Br J Ophthalmol.2005;89:859-63. Tartarella MB, Takahagi RU, Braga AP, et al. Persistent fetal vasculature ocular features, management of cataract and outcomes. Araq Bras ophthalmol.2013;76:185-8. Alexandrakis G, Scott IU, Flynn HW Jr, et al. Visual Acuity Outcomes with and without Surgery in Patients with Persistent Fetal Vasculature. Ophthalmology.2000;107:1068-72.